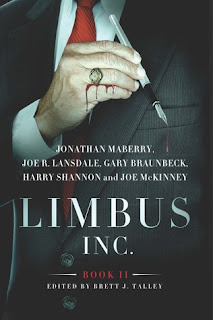 Limbus, Inc. Book II, edited by Brett J. Talley with stories from Jonathan Maberry, Joe R. Lansdale, Gary Braunbeck, Harry Shannon, and Joe McKinney, is available directly from the publisher, Journal Stone. You can also purchase this book at Amazon, Barnes and Noble, or BooksAMillion. Here's where you can find information about the third installment: Limbus, Inc. Book III (available July 29, 2016). That question echoed through the world’s underground, scrawled on bathroom walls, spray-painted across subway tunnel exits, written on paper that fluttered through bleak side-streets in the winter wind, printed on cheap business cards tacked to corkboard displays in darkened hallways. But always beneath one name—Limbus. Matthew Sellers revealed the truth of Limbus, Inc. to the world, and in his tales of time travelers, intergalactic beings, and human sacrifice, he thought he had told it all. But the story of the shadowy employment agency that operates on the edge of the abyss, always finding the perfect person for the perfect job—no matter what the cost—had only begun. This shared-world anthology continues the story of Limbus, Inc., as told by five masters of horror, fantasy, and science fiction. But beware, for once you learn the truth of Limbus, Inc., your world will never be the same. So it's time to ask yourself . . . How lucky do you feel? I loved the first book - which I described to a friend as Doctor Who with the cheese-factor replaced by blood and gore - and I think I liked this book even more than the first (even though there's less guts on display). I adore the concept - five short novellas featured within a short novella, all written by different authors who cover a different sub-genre of speculative-fiction. The stories are linked by a shady and powerful organization known as Limbus, Inc and it's difficult to describe the organization without giving away so spoilers so I won't. Just know that the purpose of the organization changes with each story. Each story is well-written and I enjoyed all the stories but Jonathan Maberry gave me a book-hangover with Three Guys Walk into a Bar, which features both Joe Ledger from the Joe Ledger series and Mike Crow from the Pine Deep Trilogy. I haven't read the Pine Deep trilogy yet but it's now on my to-do list. I eagerly await future installments of this series and wish there were more books of a similar design (multiple linked shorter tales written by different authors) on the market.